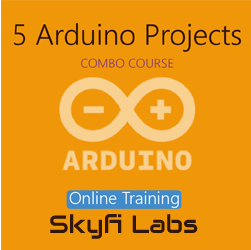 This course is your ticket into the world of Arduino. You will work on basic to advance level Arduino projects with practical exercises on key technologies. Login to our Online Learning Portal will be provided instantaneously upon enrolling. This Portal gives you access to video lectures, tutorials and quizzes required to build your project. 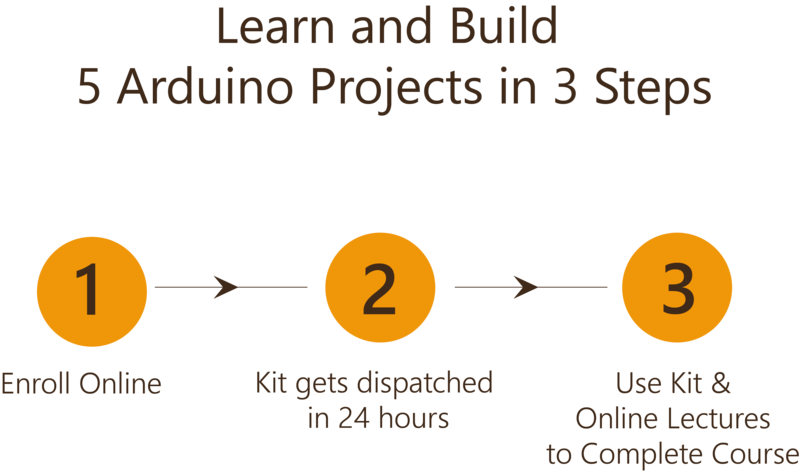 Roboversity 5 Arduino Project Combo Course Kit will be dispatched to you within 24 hours of enrollment. Use this kit along with the online portal to learn and complete the project based course. As you complete the course your project will also be completed. Module 1: What is Arduino? Module 3: What is Animatronics? Module 9: What is Solar Tracking? Learn: How does the Solar Panel Work? Review: What is Solar Tracking? Module 10: How to detect light intensity? Review: How to detect light intensity? Module 15: What is Persistence of Vision? Learn: How Persistence of Vision display works? Review: What is Persistence of Vision? Module 19: How to track Vehicles? Learn: What is a GPS? Learn: How does GPS Communicate? Review: How to track Vehicles? Module 21: How does GSM communication work? Review: How does GSM communication work? Module 23: How Electrical Energy is measured? Learn: What is Electrical Energy? Review: How Electrical Energy is measured? Roboversity 5 Arduino Project Combo Course Kit containing the following items will be dispatched to your address within 24 hours. One kit will be sent per team. 330 ohm Resistors - 5 Nos. Yellow Gear - 1 No. Servo Motors - 3 Nos. 10 RPM Motors - 2 Nos. 1000 RPM DC Motors - 1 Nos. All Roboversity certificates have a unique ID which can be verified online for authentication. Anybody interested in Arduino, Embedded Systems, Robotics, Energy, GPS and GSM technology and learning by doing can enroll for this course.